Quad exercises are important for strengthening and supporting the knees, and dumbbell squats are a great exercise to strengthen all of the major lower body muscles. Squatting is such a key movement in everyday life and mastering the squat exercise can help to improve sports performance as well as decrease the risk of lower body injuries. Below are pictures of how to do squats with dumbbells. 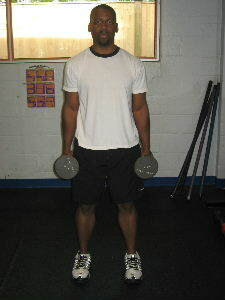 Starting Position: Begin by holding dumbbells at your sides. Position your feet about hip width or slightly wider than hip width apart. Keep your feet pointing forwards. Form: Slowly squat down as if you were about to sit in a chair. Focus on keeping more of the pressure towards the heel and ball of the foot (not in the toes). When you get to about 90 degrees, hold for a brief second and then exhale and return to the starting position. Personal Trainer Tips: The squat is a tough exercise to master because it requires good flexibility and good strength in the entire lower body. Make sure you keep good alignment by making sure your ankles, knees, and hips are almost in a straight line. 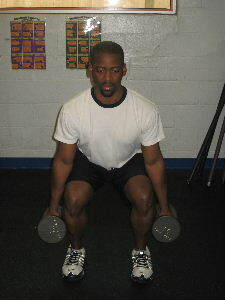 A common tendency is to let the knees cave in during squats. Another common mistake is lifting the heels off the floor. When the heels lift off the floor it places more pressure on the knees, and when the heels lift off the floor it could be a sign that the ankles are stiff and the calf muscles are tight. Stretching the calf muscles and leg muscles can improve your form during the squat. If regular dumbbell squats are difficult, you can try squats with a stability ball against the wall. Ball squats shift your center of gravity and make it easier to get more range of motion with good form. I am a big fan of squats, and I think that most people should have some type of squatting motion in their leg workout routines. Having said that there are many people that have leg injuries or knee injuries that make it difficult to squat properly with no pain. So always listen to your body and pay attention to your form. Correct form can make a huge difference in how this exercise feels. If squats are difficult try the leg press machine to work in a similar motion. The beauty of the leg press is that you can start with a really light weight and build up slowly. There are many quad exercises to choose from so pick ones that you like to include in your workouts.